Signed from Altrincham having previously played for Chester City and Witton Albion, all of Desmond's appearances came between September and November 1949 in a season when a number of players filled the outside-right position. Died: Chester & Ellesmere Port 1974. 1988-89 season. Mike moved to Sheffield United for a then record fee of £60,000, where he remained until November 1992, when he signed for Wrexham. A knee injury ended his career after which he worked for the Royal Mail. The inside-right for the Macclesfield reserve team was given a taste of senior football towards the end of the season. A strong and skilful player, who could play either in the midfield or up front, Colin signed from Winsford United having previously been with Flixton and Manchester Sunday side Astro. During his time at the Moss Rose he attracted the interest of a number of Football League sides with his natural athleticism, power in the air together with his deceptive pace and control. He gained a Cheshire Senior Cup winners' medal in 1991. On leaving Macclesfield he moved to Halifax Town in the summer of 1993 moving to Hednesford Town in the summer of 1995 and later played for Winsford United and Chorley before returning to Hednesford Town for a time as manager. A former Blackpool trainee, Rickie joined the Silkmen in December 2000, initially playing most of his football in the Youth and Reserve teams in the centre of midfield where he gave some impressive performances. He broke into the senior side towards the end of the season and was promoted to the first-team squad for the 2001-02 season, quickly becoming a regular in the starting line-up where he was equally effective in midfield or as a striker. Rickie possesses a devastating right-foot from set-pieces and in November 2001 he scored two spectacular free kicks in the FA Cup tie against Forest Green Rovers at the Moss Rose (his first ever FA Cup appearance), and the following week scored a hat-trick against Luton Town, again at the Moss Rose. Rickie moved to Stockport County in April 2002 for a club record fee of £300,000. He moved to Rochdale on a free transfer, then to Bristol Rovers for a fee of £200,000, in August 2009 to Southampton for a fee of £1M where he continued to be very successful. Made his Premier League debut on 19 August 2012 against Manchester City when he scored Southampton's first goal of the match and went on to make 235 appearances scoring 117 goals in all competitions during his time on the south coast. His move to Liverpool for fee of £4M in the summer of 2014 took him back 'home', but he was underutilised and signed for West Bromwich Albion for fee of £3M in the summer of 2015. Moved to Cardiff City in the summer of 2016 but suffered a serious leg injury which took time to heal, and with other injuries following led to him being released by the Bluebirds in September 2017. On 2 October 2017 Rickie announced that he had decided to retire from playing football. At international level, his debut for England came from the substitutes' bench in the friendly match against Scotland at Wembley on 14 August 2013, scoring the winning goal with his first touch and went on to make a total of 11 appearances scoring three goals. In April 2018 Rickie was awarded the Sir Tom Finney Award for his outstanding contribution to football. Signed on non-contract forms from the Welsh League at a time when the side were depleted through injuries. Richard came into the professional game late at the age of 23 when he signed for Plymouth from Bedworth, before moving to Stockport County for a fee of £50,000. Whilst at County he had a successful loan spell at the Moss Rose in the Conference Championship season and was signed by the Silkmen in the summer of 1997. During the 1997-98 season, the tall striker found himself squeezed out of the side on several occasions by new arrivals as Sammy McIlroy tried to find a goal scoring formation, but still finished as one of the team’s top scorers. In his next season, he spent much of the time out on loan at non-League sides Nuneaton Borough, Netherfield and Atherstone United, before being released in the summer of 1999 when he signed for Hednesford. Richard later moved to Altrincham, then Radcliffe Borough and is now Stockport County’s kit man. From Stockport, given a two match trial in a season when several players were being tried out in the centre-forward position. Known to have played for Clapton Orient (now Leyton Orient) at the same time as his brother Hubert. He went on to play for Hazel Grove and Hurst before moving to Macclesfield. He first played for Macclesfield in 1913 when he was almost ever-present from his debut to the end of October 1914 leaving the club to join the King's Royal Lancasters along with his two brothers in the First World War. He was described as an influential and spectacular player being one of the best outside-rights in the Lancashire Combination. After the War made five appearances for Hurst as one of 95 different players used by them, before signing for Hazel Grove again in 1919 and was then on the books of Mossley but never progressed beyond their reserve team. He returned to Macclesfield, his third club during the 1919-20 season, initially playing for the reserve team. He moved to the senior side for a series of eight consecutive matches in October and November 1919 and re-appeared for two matches towards the end of the season at a time when a backlog of matches was being cleared. Before joining Macclesfield played in the Cheshire League with St Helens Town. Whilst Geoff was not a regular in the starting line-up, he made a valuable contribution scoring, on average, one goal in every three appearances. He scored two goals in the 4-1 win at Gainsborough Trinity and another brace in the 3-0 home victory against Netherfield. A fringe player, brother of David. A Busby babe at Manchester United, David had also played for Southport and Altrincham before joining the Silkmen for a fee of £100. He was a stylish, fast and clever ball player who played on both wings. Scored a hat-trick in two and half minutes in the second qualifying round of the FA Cup in September 1965. He was a salesman in the soft drinks trade whilst at Macclesfield. He moved to Stafford Rangers and then Nantwich Town. Later he worked for Littlewoods Pools. Brother of Allan. Made just one appearance and, like so many other players during the 1911-12 season, was probably on trial. Came through the ranks at Notts County signing his first professional contract with them at the age of 18, but did not break into the senior side spending time on loan at Grantham Town during the 2013-14 season. Signed for the Silkmen in August 2014 but found it almost impossible to force his way into the side becoming a fringe player. He scored his one goal in an early round of the Cheshire Senior Cup at Hyde in January 2015. Spent a short time on loan at Witton Albion early in 2015. On leaving Macclesfield, after trials at St Mirren and Cambridge United during the summer of 2015, signed for Torquay United moving to Rushall Olympic in November 2015 and then to Boston United in January 2016 for the remainder of the 2015-16 season. In the summer of 2016 signed for Ilkeston but moved to Coalville Town in January 2017 and then to Carlton Town in February 2017. Signed for Alfreton Town in the summer of 2017 signing dual registration forms with Sutton Coldfield on 1 September 2017 but moved to Ilkeston Town in March 2018, and having assisted them in gaining promotion to the Midland Football League Premier Division was retained for the 2018-19 season however, was signed by Nuneaton Borough in January 2019. Born in Cornsay, County Durham, started his career with Spennymoor United before moving to Castleford Town (July 1920), Spennymoor United again (September 1920), Grimsby Town (May 1921), Worksop Town (August 1923), York City (summer of 1925), Nottingham Forrest (September 1926) and Southport (June 1927). Signed for Macclesfield in July 1929. During the 1929-30 season he was the only player to be ever-present and also held the outside-left position throughout the season despite several changes of positions within the team as a whole. He scored on his debut and made a useful contribution of 18 goals in a season when the team amassed a total of 181 goals in all competitions. Joe gained a Cheshire Senior Cup winners' medal in 1930. Moved to Ashton National for the majority of the 1930-31 season. Returned to Macclesfield for the 1931-32 season, but could not establish himself in the team only making three appearances but scored two goals. In the end he asked to be released from the club and signed for Chorley in July 1932. He was mine host of the Green Dragon and later at the George Hotel. Died in Buxton on 29 August 1958. Signed for Macclesfield on 17 December 1908. Although he only featured in the second half of the 1908-09 season he was top season scorer with 15 goals, including four in the 5-0 home win against Denton in February 1909, helping the team to win the Manchester League Championship. He started the 1909-10 season as the first choice centre-forward playing regularly until the end of December 1909 when he lost his place to J McAngus. When Tommy Nolan was injured he returned for the home match against Tyldesley Albion on 5 March 1910 but was unfortunately injured, however, towards the end of the season he returned for the Cheshire Senior Cup Final when the team were runners' up and for one league match. He represented Cheshire County in December 1909. Played for Manchester North End and was then on the books of Burnley before playing for Altrincham. Only with Macclesfield for a short time with all his appearances coming within a space of 14 days, his one goal was scored on his debut in the 2-1 win. A product of Macclesfield School Old Boys where he played at centre-half, he signed for Macclesfield in the summer of 1901. During the 1901-02 season his time was divided between the senior and the reserve teams but he was promoted to the senior side for the 1902-03 season. He filled various defender positions with ease (the committee of that time were well known for moving players from one position to another) and was a popular and respected player. By the 1904-05 season George only played occasionally as he had left Macclesfield to attend college. He was the son of the vicar of Hurdsfield. A native of Southport, he moved to Macclesfield from Southport Central Club when he came to work in Macclesfield, making his debut for the side in April 1889. Scored the only goal in the semi-final of the Cheshire Senior Cup in February 1890, and gained a winners' medal in the competition when he also scored a goal in the 4-1 victory over Nantwich in the final the following month. Also made a handful of appearances in Macclesfield's Combination League side. By trade he was a tailor working at Swanwick's in Market Place. Albert commenced his football career at Stoke City playing for them as an amateur before signing professional forms for Port Vale where he spent 10 years and was captain before moving to Macclesfield. At Port Vale he was a member of the team which won the Third Division (North) title and were FA Cup semi-finalists in 1953-54, then was ever-present in Vale's 1958-59 Fourth Division title triumph. He was promoted to manager in July 1963 on the departure of Frank Bowyer and, like his predecessor, was a firm disciplinarian. Albert was a successful manager: in his first season in charge the team won the Cheshire Senior Cup and were Champions of Cheshire League. In the following three seasons the side finished second, third and fifth in the Cheshire League. He left the Moss Rose in April 1967 spending the following 28 years as an education welfare officer. He died in July 1999. A member of the Macclesfield Youth Team. His one appearance came when members of the youth team where fielded for the Cheshire Senior Cup tie. Released at the end of the 2012-13 season. Since leaving Macclesfield Liam has played for Vauxhall Motors, Bootle FC, Waterloo GSOB and Alder FC. Kent when he moved to Congleton playing throughout the 1895-96 season gaining a winners' medal in the Cheshire Senior Cup. Moved to Woolwich Arsenal on leaving Macclesfield where he made 10 senior appearances between 1896 and 1898 and signed for Queen's Park Rangers in August 1899. Joined Macclesfield from Crewe Alexandra appearing regularly in the first half of the season. He scored on his debut and netted a hat-trick in the 5-4 home win against Winsford United in the FA Cup preliminary round. On leaving the Moss Rose signed for Mossley. With Keith Goalen injured, reserve team player Ledgar was introduced. His firm tackling was not appreciated by the Bangor supporters who 'got on his back' which had a detrimental effect on his game. At one stage of the match his tackle gashed a Bangor player resulting in the referee inspecting Ledgar's boots and sending him off to have a nail knocked back in. This proved to be his sole appearance for the senior side. Prior to joining Macclesfield in November 1937 he played for Wisbech (on two occasions), Peterborough and Glentoran. A consistent performer, Andy was ever-present in the side from his debut until the final few matches of the season. He had already incurred a knee injury during this time but injured his knee again, which sidelined him to the end of the season. After the summer break he played in a pre-season match in 1938, but his knee gave way again and had to be carried off the pitch. Unfortunately this injury ended his football career. A local amateur who was a member of the reserve team normally used as a stand in for the senior side. Previously with Grantham he was given an early season one match trial, and was one of 10 players who only made a single appearance during the 1927-28 season. Played for Cradley Heath before serving in the Army during WW1. On the books of Aston Villa from March 1919 and during his time there was given a one match trial at Macclesfield on 5 April 1920 but was not signed at that time. He then moved to Stoke City in August 1921. Signed by Macclesfield in the summer 1922. He shared goalkeeping duties with Joseph Anderson in the 1922-23 season, but at the start of the following season he was the first choice 'keeper. Even though he had been ever-present until early January 1924 he then lost his place to H. Wood. Whilst at Macclesfield he liked to take penalty kicks and was successful on two occasions. Signed for Stourbridge in the summer of 1925. Having spent a successful three month loan spell at the Moss Rose from Manchester United in the 2005-06 season, Tommy moved to Macclesfield on a permanent basis in the summer of 2006. He shared goalkeeping duties with Jon Brain in the early part of the season but picked up an injury which left him side-lined for a period during which time Jon Brain broke a leg. On recovering to full fitness, Tommy returned to the side and, other than for one match, was Macclesfield’s sole ‘keeper for the second half of the season. His performance improved as the campaign progressed, and on more than one occasion he kept the side in the game with some excellent saves. Tommy continued as a member of the Silkmen squad, and was first choice ‘keeper in the 2007-08 season until he broke his hand in November when he was replaced by Jon Brain. Towards the end of the season, Tommy spent time on loan at Rochdale when he appeared in the Coca-Cola League Two Play-off Final at Wembley. In the summer of 2008 he signed for Chesterfield. Announced on 6 November 2017 that Tommy had been forced into early retirement at the age of 31 due to a shoulder injury. Having featured in two League Two title-winning sides and helped Chesterfield win the Johnstone's Paint Trophy in 2012, he made a total of 373 appearances for Chesterfield and at the time of his retirement was 15th in the club's all-time appearances. As part of his Testimonial, in conjunction with local Brewery, Brampton, Tommy has launched the Brampton Brewery TestimoniALE 373 ale from which it is assumed a portion of the profits will be assigned to his Testimonial Fund. The name of the ale recognises Tommy's 373 appearances for Chesterfield. Having retired from playing Tommy was appointed Goalkeeping Coach at the Sheffield Wednesday Academy in August 2018. There is no information recorded for this player who only made the occasional appearance over his three seasons with the club. Stop-gap 'keeper for the Hallefield-Macclesfield side at the beginning of the1899-1900 season until the appointment of Ennis. A member of Macclesfield's reserve team who also appeared at senior level mainly during the 1886-87 season. Terry was a highly experienced and much travelled defender whose football career started as a member of the youth team at Stoke City in 1968 and concluded at Macclesfield in 1986. Turned professional in July 1969 at Stoke City where he remained until 1975 making 24 league appearances. However, he spent time on loan firstly in South Africa playing for Cape Town City and secondly at Crewe Alexandra. In 1975 he made 16 league appearances and scored one goal for San Jose Earthquakes in the North American Soccer League. On his return to England he signed for Port Vale (41 league appearances and two goals) who paid Stoke City a fee of £3,000 for his services. In August 1976 he was sold to Dutch side Sparta Rotterdam (33 league appearances and one goal) for a fee of £25,000 in the Eredivisie and then spent two years from 1977 to 1979 with top-flight club Roda JC. On his return to England he signed for Birmingham City (12 league appearances) in 1979 and then Newport County (25 league appearances) in 1982. After a short spell in Hong King in 1982 playing for Morning Star he returned to Dutch football with DS'79 in 1982 helping them to win the Eerste Divisie title in the 1982-83 season. Unfortunately in the 1982-84 season the club completed the season in bottom place. Returning to the England again he signed for Stafford Rangers (1984), Altrincham (1984) and Scunthorpe United (1984-85) where he made 31 league appearances and scored one goal. To complete his career he spent the 1985-86 season at Macclesfield Town where he featured regularly in the team. After retiring as a player he was manager at non-League clubs Hanley Town, Kidsgrove Athletic and Ball Haye Green and was also assistant manager at Meir K.A. On leaving football he managed a burger van. From the Potteries, he was one of eight different players used throughout the season at inside-right. Dave played mainly for the reserve team. A speedy winger signed from Stalybridge having started his football career at Irlam. Another player who attracted the interest of Football League scouts including Preston North End. Whilst playing for Macclesfield, he was chef at the Fools Nook pub where his father was the licensee. Moved back to Stalybridge Celtic initially on loan but then permanently for a fee of £750. Later played for Witton Albion, Ashton United, Leek Town, Radcliffe Borough and Flixton after which he undertook a coaching role at Manchester University with their first team. Also a member of Manchester United's Academy where he is a coach for the Under 12s. A Mancunian, it would appear that he was signed by Macclesfield in the summer of 1911, however, he did not establish himself in either the Manchester League or the Lancashire Combination teams. His three appearances came in September and October 1911 and January 1912. Came into the side when they were struggling to find any sort of form, and was perhaps unfortunate that in his first nine appearances there was only one victory, however, he was on the score sheet for the home win against Runcorn. Gordon's daughter, Andrea Priestley, has inform us that her father joined the Silkmen probably after completing his National Service and that he had played football during his Army days. Gordon died in 1996. Made a single appearance in the 1906-07 season, possibly on trial, and was signed for the Macclesfield reserve team for the 1907-08 season. Lennard played in three consecutive senior matches in March 1908 deputising for Trueman when he was out of contention due to illness. John made just one senior appearance for the Silkmen in the second leg of the Semi-final of the Cheshire Senior Cup. His three appearances came at the beginning of the season in place of the regular ‘keeper Steve Farrelly in Sammy McIlroy’s first season in charge as manager. 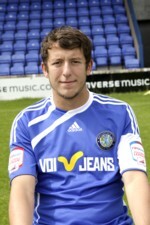 Andy moved to the Moss Rose from Oldham Athletic. He was used solely in Cup competitions, including appearing in the two legs of both the Semi-final and the Final of the Spalding Challenge Cup when Macclesfield finished as runners-up. Also gained a winners' medel in the Staffordshire Senior Cup in 1997. On leaving the Moss Rose, Andy moved to Caernarfon Town for the 1997-98 season. More recently he has played at non-League level for clubs in the North West of England including Winsford United, Abbey Hey and Glossop North End. Andy is a capable musician. He is Head of Music at a Manchester College, plays the violin in a classical string quartet, plays in a Greek/Jazz band and leads ensembles across the North West. Joined Macclesfield from Moston, Manchester in March 1920 at a time when Macclesfield were clearing a back-log of matches, especially in the Subsidiary Competition. Said to have declined an approach from Blackpool. An energetic central midfielder who first joined Macclesfield at the age of 16 from Everton progressing to the youth team. Appeared in both the Cheshire Senior Cup matches for the 2012-13 season scoring a penalty in the second tie against Stalybridge Celtic. Gained his first professional contract in the summer of 2013. In the early part of the 2013-14 season Paul was used sparingly and was unavailable for a time due to a groin strain. Gradually he was used more frequently and by the end of the season had established himself as a reliable member of the side growing in strength and ability all the time. His league goal was the winning goal scored in the 90th minute in the 3-2 victory at Forest Green Rovers in October 2013. Paul was regularly in the starting line-up from the beginning of the 2014-15 season performing as strongly as ever. He was unfortunate to break his collar bone in the first minute of the FA Cup Fourth Qualifying round replay at Wrexham at the end of October 2014 which left him out of contention until 17 January 2015 when he returned for the away match at Kidderminster, and then featured regularly in the starting line-up for the remainder of the season. He was voted the most improved player for the 2014-15 season and gained a winners' medal in the Cheshire Senior Cup competition. Paul was dogged by injury during the 2015-16 season with the result that he only featured in 28 of the 54 matches, nevertheless, when he was in the team he made some strong and telling midfield performances scoring five goals including the winner against Guiseley at the Moss Rose. In the first half of the 2016-17 season Paul was a regular in the side only missing a few matches through injury. His best performance came against top-of-the table Tranmere Rovers at the Moss Rose on 1 January 2017 when his hat-trick earned the Silkmen a well deserved victory. Signed a three and a half year contract with Cambridge United on 13 January 2017, Macclesfield receiving an undisclosed fee. Spent time on loan to Dover Athletic in September 2017. Enjoyed league experience at Wrexham and had also played for Ellesmere Port and Winsford. Was a regular in the starting line-up throughout the season and was the club captain for a team which reached the Semi-final of the Cheshire Challenge Cup. Patrece commenced his career with Bradford City centre of Excellence before moving to Nottingham Forest where he played in the youth and reserve sides. When he was released, after a short trial with Cardiff City, he joined Guiseley, then Worcester City, Garforth Town and Dorchester Town where he was made team captain. When Dorchester encountered financial problems, Patrece was released in February 2009. After a trial at Macclesfield he signed non-contract forms to the end of the 2008-09 season. Patrece made his Football League debut in his one and only appearance at centre-back for the Silkmen in their last match of the 2008-09 campaign, at a time when other defenders were out of contention through injury. Signed for Farsley Celtic in the summer of 2009 and in July 2010 signed for Belgium Fourth Division club Royal Racing Club Montegnee, returning to the UK in 2012. Since then he has played for Thackley AFC, Harrogate Town, Garforth Town, Cuzon Ashton, Frickley Athletic, Ossett Town and Worksop Town. There are no records of his playing career extending beyond 2013. At international level has represented St Kitts and Nevis in World Cup qualifying games. Johnny's football career started with Manchester Boys, and having spent two seasons with Altrincham he signed professional forms with Aldershot. He was a Flight Lieutenant in the RAF where he was a sports' officer. During the Second World War he guested for Manchester United, Stockport County and Bolton Wanderers. After the war he left Aldershot due to a housing shortage. With Foxcroft leaving the Silkmen at short notice in November 1946, Macclesfield signed Johnny as their regular goalkeeper. He was recognised as a talented ‘keeper who played many brilliant games and was almost ever-present until he moved to Wellington in November 1947. Started his career at in his home town playing for Staveley Old Boys before moving to Derby County (May 1920), and then Manchester United (October1922) but only made two senior league appearances there. Wilfred spent the next five years from August 1923 with Exeter City making almost 100 league appearances and scored 38 goals. He then partnered Cecil Smith (see separate entry) at Wigan Borough in the 1928-29 season before moving to Cardiff City in May 1929 where he scored over 30 goals for their reserve side and made three appearances with the First Division side. Wilfred signed for Macclesfield in the summer of 1930 regularly filling the inside-right position from the start of the season until March 1931. He was a stylish performer with a good shot, scoring 20 league goals including a hat-trick in the 6-1 home win against Altrincham in November 1930. Wilfred died in February 1979 at the age of 76. Kyle represented Bermuda at international level in both football and cricket and started his English football career at Scarborough in 1992. He then played for six other clubs either permanently or on loan, including Coventry City (£500,000 fee) and Stoke City (£500,000 fee), before moving to Macclesfield in the summer of 2001. In his first season he found it difficult to settle into his striker’s role partly because of an ankle injury, but enjoyed an injury free second season when he made a useful contribution showing more pace up front and good defensive work against set pieces, scoring 13 goals including his 100th Football League goal. Kyle was released in the summer of 2003 when he returned home to become the manager of the Bermuda National Football Team for the 2004-05 season after which he took a career break. He was part of the management team (although still registered as a player) of the Bermuda Hogges from 2007 to 2009, alongside Shaun Goater. Having retired from playing Kyle continued his management career with PHC Zebras (2010-11), Walsall (forward coach - 2011-12) and then Robin Hood (2012-13 to 2016-17). Returned to the international scene as manager of the Bermuda Under 20 side for the 2015-16 season (initially combining his duties as manager at Robin Hood from 2015-16 to 2016-17), and was then appointed assistant manager and later caretaker manager of the National team before becoming manager again in July 2018. Mark came to Macclesfield from Witton Albion having gained vast experience in the Football League. His career began at Huddersfield where he made over 200 appearances and scored 56 league goals and was captain for two years. He then spent time at Manchester City (fee £130,000), Derby County (fee £200,000), Aston Villa, Scunthorpe United and Stockport County. In his first season at Macclesfield Mark played in the majority of the matches but was appointed coach for the 1994-95 season with his player registration retained although he only made four appearances. In 1994 gained winners' medals in the Conference League Cup and Staffordshire Senior Cup competitions. When he left the Moss Rose he was appointed Youth Team manager at Huddersfield Town becoming assistant manager at Scunthorpe in 1996. His first full managerial appointment was at Halifax Town in 1999 which he held until September 2000. In March 2003 he was caretaker-manager of Derby and, also in March 2003, he became assistant to Sammy McIlroy in charge of the Northern Ireland side. When Sammy McIlroy was appointed manager at Stockport County, Mark was again his assistant and when McIlroy quit the job Mark was caretaker-manager until December 2004. Yet again Mark became assistant to Sammy McIlroy, on this occasion at Morecambe, a position he held until the end of the 2010-11 season when they both left the club by mutual consent. Subsequently Mark was appointed Academy Manager at Huddersfield Town and in February 2012 was given temporary responsibility for the first team on the departure of the manager. Mark left Huddersfield in 2016 having been their Academy Manager for four and half years at the time of a review of the Youth System as a whole. In 2017 was appointed Assistant Manager to John Gregory at Indian Super League Club Chennaiyin FC. Craig spent ten years in the Liverpool Academy before being promoted to the first team squad and scored in his first match, a friendly at Crewe. He gained league experience with loan spells at Notts County and Chester in the 2007-08 season and in the following season Craig spent the first half on loan at Bournemouth and at Port Vale, the second half at Accrington Stanley. He left Liverpool in August 2009 and had trials with a number of clubs before signing for Macclesfield on Christmas Eve 2009. The inclement weather meant that he had to wait until 23 January 2010 to make his debut against Port Vale. He made a further 17 appearances either as a striker or as midfield cover. An enthusiastic player, nevertheless, he was released by Macclesfield in the summer of 2010 when he signed for Accrington Stanley, moving to Chester in the summer of 2013 and FC United in 2014 where he made 67 appearances and scored 19 goals. Signed for manager Sean Hessey (former Silkman) at Marine in the summer of 2016. After Sean Hessey's dismissal as manager, Craig's contract was cancelled by mutual agreement at the end of February 2017, however, he signed for Trafford in early March 2017. Returned to FC United in the summer of 2017 and having been released at the end of the 2017-18 season signed for Nantwich Town. Whilst Nantwich held Craig's registration as a non-contract player he also signed for Runcorn Town in September 2018 and Curzon Ashton in January 2019, and as such was registered to three clubs. In February 2019 Craig moved from Curzon Ashton to Radcliffe FC at which time Nantwich Town released his registration with them. Runcorn Town continue to list his profile as a current player, therefore, it would appear that a dual registration remains with them. Craig played for the England Under-19 side in the 2006-07 season on seven occasions. This was a trial match for the young 'keeper who took the place of regular 'keeper Dave Jones. Moving from Tranmere Rovers, Lingard signed for Macclesfield in the summer of 1913 going straight into the side. He was almost ever-present until the middle of December 1913 when he was injured with torn stomach muscles towards the end of the match at Nantwich. A tricky winger, it was reported that he was one of the team's best players. He returned for the home match against Witton Albion on 31 January 1914 and went on to help the side win promotion from the Second Division of the Lancashire Combination. He featured regularly in the First Division side in the 1914-15 season until January 1915 when he resigned so that he could devote more time to his business. However, played for Altrincham in the war time leagues in 1915-16 and 1917-18. Having played for Altrincham, Wythenshawe Town and Rossendale, Colin signed for Crewe Alex from Hyde United in February 1996 where he was a member of the side which defeated Brentford in the play-off final at Wembley in 1997. Colin had two loan spells at Macclesfield in the 2002-03 season, the first ending in the eighth minute of his first match with a reoccurrence of a hamstring injury, but he returned to play his part in the Silkmen’s successful battle against relegation. He signed permanently in the summer of 2003 when he was asked to play in a wide-left midfield position rather than in his more accustomed role as a striker. Nevertheless, he gave some sterling performances and always made an impact when coming on from the substitutes’ bench. He left the club in March 2004 and shortly after signed for Halifax Town and later moved to Altrincham. He left Altrincham at the end of the 2009-10 season to take up the appointment of Assistant Coach to Manchester United under 13s team and to play for FC United of Manchester. Being on the coaching staff at Manchester United, Colin is credited with having played his part in the development of striker Marcus Rashford. More recently played for Radcliffe Borough, New Mills and Witton Albion, but retired from playing semi-professional football in 2012 although Colin continued to turn out for Sunday League teams in the Wythenshawe area. Colin continues to work at Manchester United where he is an Under 18s coach. In 2018 as part of the 50th Anniversary celebrations of the formation of the Northern Premier League (now the Evo-stik League) a vote was held to find the top 100 NPL players in which Colin was in 69th position. Having appeared in a pre-season practice match he was given a one match trial in the senior side, however, he was not retained. A local player who initially featured in the Hallefield-Macclefield side in the North Staffordshire and District League. Re-signed in the summer of 1901 but only appears to have featured in a few matches, his last appearance being recorded on 23 November 1901. There is no information recorded for this player whose two appearances both came in the FA Cup competition when he played place of Howarth and then in place of Tommy Nolan. On his debut he scored the first goal in the 3-2 victory. The match with Wrexham Reserves was the first match after the famous FA Cup match against Fulham. 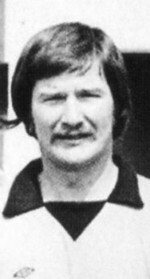 Some of the senior players were rested including goalkeeper John Cooke for whom Brain deputised. The Silkmen won this match with a score-line of 2-1. Started at Saltney before signing for Chester (September 1912) and then Stockport County (May 1914) where he made 11 senior appearances from December 1914 to February 1915. Made just a single appearance, probably on trial, for Macclesfield in October 1914. After WW1 he signed for Crichton's Athletic in 1919 and then Winsford United (April 1920), Wrexham (May 1921) and Ellesmere Port Cement Works (August 1922). He returned to Macclesfield in May 1923 when he featured in two end-of-season matches. Signed for Rhyl Athletic in June 1923 and then Chester (summer 1924), Rhos (September 1925), Flint Town (September 1926) completing his career with Sandbach Ramblers. Brought in at the same time as Jim O’Connor to provide experience in the midfield. Norrie was signed from Stockport County where he had just won a 4th Division Champions medal. He had also played for Southport. On leaving the Moss Rose he played for Darwin and then Leyland Motors. He later became a publican in Leyland and later ran two further pubs in Preston. Started his career at Port Vale in the club’s under nine side working his way through the ranks to their youth system to become a member of the professional staff making his senior debut on 30 April 2011. He made 18 senior appearances for Port Vale but spent time on loan at Tamworth in 2013 and two loan spells at Chester during the 2015-16 and 2016-17 seasons where he made a total 71 appearances in all competitions. With limited opportunities for first team football at Port Vale, Ryan was released at the end of the 2016-17 season. Signed a two-year contract with Macclesfield Town in the summer of 2017. A regular in the starting line-up usually on the left wing in the first half of the season, Ryan had made this position his own until an Achilles injury forced him out of contention at the end of January 2018 ending his season, although he returned as an unused substitute for the final match. His 54th minute goal at Maidenhead on 25 November 2017 was voted 'Goal of the Season' when he hit a stunning long range shot from just inside the Maidenhead half, the ball hitting the back of the net without bouncing. Gained a Vanarama National League championship medal for the 2017-18 season. Moved from Crewe, taking over goalkeeping duties from AG Hawley but was replaced by Frank Smith towards the end of the season after a run of defeats. When Stuart came to Macclesfield he was described as a promising young defender who had been an apprentice at Manchester City. He spent two years at Norwich Vics before moving to Stalybridge and then to the Moss Rose. During his time as a Silkmen, Stuart faced competition for the right-back position, initially from George Shepherd whose place he took for almost four months after he was injured, and then Dave Norman and Cec Edey. Gained a winners' medal in the Staffordshire Senior Cup competition in 1994 and played a part in Conference Championship side in the 1994-95 season. He moved to Flixton on a long term loan early in 1996 and was signed by Leek Town the following summer. He is now based in Hazel Grove and has worked as a HGV driver. Moved from Fleetwood having been on the books of Leeds United at some stage. Was almost ever-present until March 1957 when he was often replaced by Ridgway. Resigned from the club in January 1958. Paul’s career started at Everton in 1979 from where he spent time on loan at Wigan Athletic and Rotherham United. He moved to Preston North End in 1983 and Bolton Wanderers in 1984 spending a short time on loan at Port Vale before signing for Stockport County. He moved into the non-League scene with Southport, including a spell as caretaker-manager, and then Macclesfield Town where he spent two seasons. On leaving Macclesfield he moved to Witton Albion, then Morecambe (fee £3,000), Lancaster City, Chorley, Burscough and Bangor City. He was then assistant manager at Stalybridge Celtic, manager at St Helens Town, Youth Coach at Accrington Stanley, manager at Chorley and then Head Coach at Accrington & Rossendale College and more recently Academy Manager at Accrington Stanley. A Macclesfield lad, Frank was playing for Buxton in the 1906-07 season but was signed from Congleton Town appearing for Macclesfield's Manchester League team in the 1909-10 season, although he was primarily a member of the reserve side at this time. There is no record of him playing for the club in the 1910-11 season but during the 1911-12 season he appeared regularly for both the Manchester League and the Lancashire Combination teams. During the 1914-15 season he made a few appearances at left-half before Hyde established himself as first choice in that position. Towards the end of the season he made three appearances at outside-left. Said to be a clever little player who was always in the thick of the fray. Returned to play for the Macclesfield reserve team early in the 1919-20, and made his one senior appearance in the Subsidiary Competition at a time Macclesfield were clearing a back-log of matches. Also played football for Neckwear FC and cricket for North Rode. He died in April 1930. Brought in from Leek Alexandra as cover for injured players scoring two goals on his debut in the 5-3 victory. According to the book 'The Official History of Wigan Athletic' by Dean Hayes published in 1996 Billy began his career at Netherfield scoring four goals on his debut. Having scored 14 goals in his seven games for Netherfield he signed for Carlisle. Billy was a paratrooper in the Second World War and took part in the infamous Arnhem battle. Signed for Macclesfield from Carlisle United in 1946. He was described as a dashing centre forward and was a prolific goalscorer. Joint top-scorer in his first season and top-scorer in both 1947-48 and 1948-49, he scored two of the goals in the 3-2 replay victory against Altrincham to win the Challenge Cup in April 1947. His goal scoring record also includes four hat-tricks in the calendar year of 1948. On leaving Macclesfield in 1949 he signed for Wigan Athletic where he continued his goal scoring achievements, with a tremendous record netting 179 goals in 230 appearances in all competitions, making him second to Harry Lyon in the club's all time scoring records. 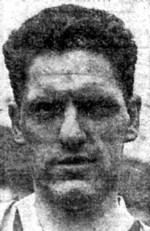 He was Wigan's top-scorer in the 1949-50 season with 42 goals and again in the 1950-51 season with 55 goals in their Lancashire Combination League One side. Having commenced the 1951-52 season with Wigan he moved to Nelson but returned to the Latics in the 1952-53 season remaining there until 1955. He won three Lancashire Combination Championship medals with Wigan. Later played for and managed Wigan Rovers. Away from football he had been a foundryman and a miner at Bickershaw. Whilst he lived in Aspul for most of his life he retired to Skegness. Died in June 2008 at the age of 85. A trainee at Blackburn Rovers, Mike was released by them in the summer of 1998 when he signed for Macclesfield. A key defender throughout the 1998-99 season in the newly formed Reserve side where he showed himself to be a hard tackler with a good turn of speed, Mike eventually made his Football League debut with a 12-minute appearance from the substitutes’ bench in the last game of the season in the former Nationwide Division Two, and was released in the summer of 1999. More recently Mike has played for FC United of Manchester. Having been on the books at Oldham Athletic and Bury, Darren signed for Macclesfield in the summer of 1998 specifically to become a member of the newly formed Reserve team. The big central defender immediately took command of the defence, but had little chance to prove himself in the senior side in three short substitute appearances in Cup competitions. His contract was cancelled in April 1999 after he had gone missing for some time. Darren has featured for non-League clubs after leaving Macclesfield including Stalybridge and Hyde United. Initially signed on loan from Burton, Nigel was finally signed as part of an exchange deal for Ken Higham. He made a big impact on the side following his arrival weighing in with his fair share of goals as a midfielder, and gained a Cheshire Senior Cup winners' medal in 1983. Previously played at Frickley and Doncaster Rovers and was an electrician. There is no information recorded about this player who was probably give a one match trial in the position normally occupied by the vastly experienced Harry Pearson. A young player from the Potteries brought in for two separate matches. On the first occasion five new players, including Lovatt, were introduced in an attempt to break a series of defeats. Unfortunately the radical approach was unsuccessful when the team lost 1-7. Harry was a much travelled footballer who never stayed very long at any club. His youth career included Wood Lane United, Red Street St Chad's and Audley. In March 1924 he signed for Port Vale and moved to Preston North End in July 1924 but did not make a senior appearance for either club. In September1925 he signed for Crewe Alexandra (27 league appearances, 14 goals), and in March 1926 to Bradford City (13 league appearances, three goals), in November 1926 Wrexham (11 league appearances, five goals), August 1927 Scarborough, and May 1928 to Leicester City where he scored nine goals in nine league appearances. In December 1930 he signed for Notts County (nine league appearances, three goals) and in November 1931 Northampton (14 league appearances, seven goals). Next stop was Macclesfield signing in July 1932 where he remained until early October scoring four goals during an indifferent period for the side. On leaving the Moss Rose he moved to Stafford Rangers (November 1934) and then Winsford United (July 1936). Died Halmerend 11 September 1971. A local player brought in along with three other new players in an attempt to stem a series of losses which almost worked as the team only lost by the odd goal in five. Born in Wolverhampton, Keith started his career in his home town with Wolverhampton Wanderers graduating from the youth system to make his senior debut on 23 August 2004. Unable to force his way into the senior side he spent time on loan at six different clubs – Burnley (2005), Queens Park Rangers (2006), Swansea City (2006), Brighton & Hove Albion (2006), Cheltenham Town (2006 and 2007), and Port Vale (2007-08). Having been released by Wolverhampton Wanderers he signed for Kidderminster Harriers spending the 2008-09 season there (52 appearances) before moving to Hereford United in May 2009 (25 appearances). He signed for Cheltenham Town in the summer of 2010 going on to make 133 appearances and was Player of the Year for the 2010-11 season. Joined York City in November 2013 initially on loan, signing a permanent contract in January 2014 making 101 appearances and was voted as the club’s Clubman of the Year Player for 2014-15. Remaining there until January 2016 he then returned to Kidderminster Harriers to make a further 71 appearances. He was captain for the 2016-17 season and was named in the 2016-17 National League North Team of the Year. Having been told that he could leave Kidderminster, Keith signed for Macclesfield Town In the summer of 2017 bringing a wealth of experience to the club having made 420 career appearances and scored 32 goals. The only member of the 2017-18 Championship winning squad to play every minute in the Vanarama National League together with the FA Cup and FA Trophy matches. Always performed consistently and strongly he formed an excellent partnership with fellow central defender George Pilkington. His performance was recognised by his peers when they voted him 'Players' Player of the Year'. Matthew progressed through the ranks at Macclesfield and was awarded his first professional contract in the summer of 2009. He played for the reserves at both right-back and in the midfield. Towards the end of the 2009-10 season he appeared regularly for the senior side in midfield where he played with confidence and made good use of his long throw-ins. However, he made just one substitute appearance for the senior side in the 2010-11 season and spent time on loan at Kidderminster Harriers From March to the end of the 2010-11 season. Having been released by Macclesfield joined Nantwich Town in the summer of 2011 signing for Newcastle Town in the summer of 2015. It would appear that he left Newcastle Town at some time as he re-signed for them in March 2018 and was appointed captain for the 2018-19 season. Previously with Altrincham and brought into the side along with three other new players for the match against Runcorn in an attempt to stem a series of losses, which almost worked as the team only lost by the odd goal in five. Only featured once again in the next league match. Started his career with Bury FC Youth in the early 1970's before moving to Macclesfield initially playing the reserve team. He attracted the interest of a number of league clubs whilst still a member of the reserve side, and was on trial with Manchester City for three months during the 1974-75 season, as well as having trials with Everton and Oldham. On taking over the gloves from Willie Mailey in March 1976 he proved himself to be a capable 'keeper and was the number one until Robin Simpson took his place in March 1978. On leaving Macclesfield he moved to Australia to play for the Brisbane Lions representing them for six seasons from 1978 to 1983 and was still living in Australia in 2013. Had been on the books of Huddersfield Town, Lumb made an impression in a pre-season match when he scored a hat-trick. He was signed straight after the match, however, he only made one senior appearance despite scoring the winning goal. There is no information recorded for this player whose appearances were spread throughout his time at Macclesfield. 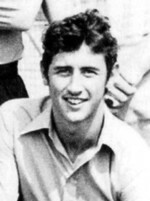 Having been a member of the youth set-up at both Bolton Wanderers and Bury, Dave signed from Mossley for whom he had played from July 1967 to September 1968. He was a tenacious and hardworking player who was a target for Football League scouts. He scored goals at vital times: one of the two goals in the 1970 FA Trophy victory at Wembley and was top scorer in the 1972-73 season. Having been sold to Wigan for £400 during the summer of 1973, Dave returned in 1975 for a second short spell on loan from Goole and returned for a third time from Runcorn..
Dave's honours at Macclesfield included two Northern Premier League Championships in 1968-69 and 1969-70, a FA Trophy winners' medal in 1970, Cheshire Senior Cup winners' medals in 1969 and 1973, and he was a member of the team which won the North West Floodlit League in 1969-70. Dave's career path is as follows: Bolton Wanderers and Bury youth, Mossley (July 1967-September 1968), Macclesfield Town, Wigan Athletic (1973-74), Goole Town (1974-1975), Macclesfield Town on loan, Poole Town (July 1975), Mossley (August 1975-May1976), Ashton United, Altrincham, Southport (1977), Runcorn and Macclesfield. He was a woodworker by trade whilst at Macclesfield. In more recent times he helped to run the family’s dry cleaning shops and has coached Under-17’s in the Tameside League. 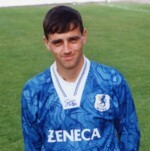 A player with a tremendous turn of pace, Darren joined Macclesfield from Droylsden for a short period in the 1989-90 season. He then had spells with Accrington Stanley and Ashton United before making his Football League debut with Bury. He then moved to Southport for fee of £3,000 before returning to Macclesfield on a player plus cash deal. Darren scored four of the seven goals in the third round Cheshire Senior Cup 7-1 victory against Colwyn Bay in the re-arranged tie at the Moss Rose in February 1994, only for the Silkmen to be disqualified as Darren’s registration had not been completed before the original date of the tie. He gained winners' medals in the Conference League Cup and Staffordshire Senior Cup in 1994. After spells on loan at Fleetwood Town and Ashton United, he returned to Macclesfield to appear in the final matches of the Silkmen’s first Conference Championship season in 1995. The following season he established himself as a regular member of the first team gaining a FA Trophy winners’ medal in 1996. Darren took part in a sprint race at Wembley to find out who was the fastest player in the Conference at that time coming a very creditable second. He was transferred to Winsford United for a fee of £3,000 early in the 1996-97 season. Subsequently he played for Halifax Town, Altrincham, Morecambe and Southport. He then held the position of player/manager at Manchester League side East Manager. Darren moved to FC United of Manchester as a player/coach in 2005 before being appointed Head of Player Development there. Following manager Karl Marginson leaving FC United of Manchester by mutual agreement in October 2017, Darren also left the club. Was appointed (date unknown) coach at Wythenshawe Amateurs. Away from football Darren has been a fork lift driver for L'Oreal and a stores manager for City Response. Started playing football at the age of 14 for youth teams before signing for Proctor's Gymnasium. He then played for Cadby Hall (Lyon's Tea firm) where he won medals for the League Championship and the Works' Challenge Cup. As a member of the Territorial Army he was mobilised for the First World War in August 1914 with the Lancashire Fusiliers. He served in Egypt, Dardanelles and then for a second time in Egypt. Fought the Turks from the Suez Canal and drove them across the desert. During his time in the Army he played for his platoon and because of the impact of rationing, meals were sparse, but it was worth winning matches as the victors were always served a special dinner. From February 1917 he was involved in working through France to a battle in Belgium where he was taken prisoner. He then had to work as a miner in a tin mine, remaining a prisoner until the armistice. He returned to England and was soon demobilised when he joined Hulme Amateur Football Club. He moved to Macclesfield in February 1920 and was ever-present in the defence to the end of the season gaining a winners' medal in the Altrincham Cup. In the 1920-21 season John continued at right-half but successfully made the transition to the forward line at the end of February. In his final season at the club, he again played in the forward line but moved back into defence in October and November 1921, but by December he had lost his place and featured in the reserve team. Away from football John was a part-time professional boxer. In October 1921 he won both his bouts at the Free Trade Hall in Manchester whilst still playing football for Macclesfield. In his two seasons at the Moss Rose, John missed very few matches and made a significant contribution with a strike rate of one goal every three matches. John scored four goals in the 5-1 home victory against Ashton United in January 1948, and was a member of the Challenge Cup winning side in 1948 when he scored two goals in the 3-1 replay victory against Altrincham.